The invisible chemicals around and within us can tell many complicated stories. By sensing them, security agents can uncover explosive threats. By monitoring them in our breath, doctors can diagnose serious illnesses. And by detecting them on distant planets, astronomers may find signs of life. These chemicals sometimes reveal their secrets when probed with mid-infrared wavelength lasers. Nearly all chemicals, including explosives, industrial, and pollutants, strongly absorb light in the mid-infrared wavelength region, which is often called the “fingerprint region” for chemicals. But lasers that work within this range have limitations. Larger, optically pumped lasers are too complex to use out in the field, and compact, lightweight diode laser sources have a limited spectral range. 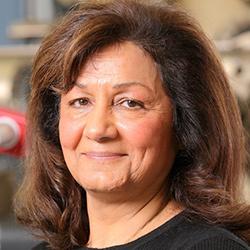 Now Manijeh Razeghi and her team at Northwestern University’s Center for Quantum Devices have used quantum mechanical design, optical engineering, and materials development to create a custom-tailored, compact laser diode by integrating multiple wavelength emitters into a single device. Capable of emitting broadband wavelengths on demand, the device is smaller than a penny and works at room temperature. It can also emit light at frequencies within +/- 30 percent of the laser central frequency, which has never before been demonstrated in a single-laser diode. Supported by the National Science Foundation, US Department of Homeland Security, Naval Air Systems Command, and NASA, the research is described online in the August issue of Optics Express journal.